One Day Without Us. Source: Instagram. All rights reserved.According to its organisers, the 2017 One Day Without Us action sought to emphasise the variety of work migrants undertake to help keep the UK afloat. 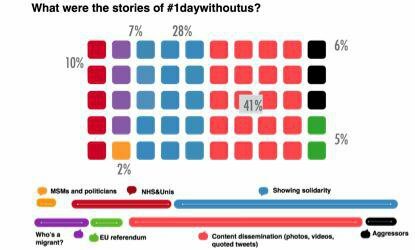 The movement, organised online under the hashtag #1DayWithoutUs was being tweeted about 85 times per minute at its peak on the 20th of Feb 2017, while nearly 20,000 tweets went out under the hashtag in the 48 hours leading up to the event. Using Twitter scraping and analytics tools (such as tags, discover text, 'r' and Excel), Photini Vrikki and I explored the stories, themes and key influencers within the movement, which had resulted in dozens of separate events across the UK. 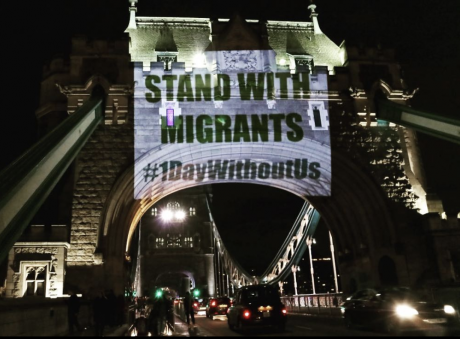 Expressions and stories of migrant solidarity, primarily through the cross-media and cross-platform campaign of #1DayWithoutUs group, sought to counterbalance xenophobic sentiments, often by offering a multiplicity of migrant voices and experiences in the UK today. Incidents such as these, which spread rumors, vituperate, and mislead, have become, in the past few years, a communication practice of online populism that aims to control public opinion and seeks to establish a frontier against an assumed enemy –coalescing across diverse sections of society. Certainly the communication practice of online populism has become widespread, laying bare what Ernesto Laclau and others have deemed the normalisation of nationalist rhetoric and the development of new frameworks for the ‘politics of fear’ that entrench new social divisions on the intersections of nation, immigration and the provision of (or contributions to) public services. ‘This is a fear of the unknown: a fear of the other, a fear of the future’, according to authors at the think tank Demos, a fear which permeates the popular imagination in the UK and Europe following the so-called migration crisis and the wave of Euro-skepticism that has dominated politics since the European Union membership referendum in the UK in 2016. But there’s more to this, beyond simply fear. The Centre for the Analysis of Social Media at Demos also undertook research on the rise of xenophobia and racism on Twitter. Looking at the ways in which this rise may have been related to campaigning tactics and the referendum result, the study also gives an indication of the ways in which Twitter was used to both report hate speech incidents and to express solidarity with migrants. What then is the common thread that links Twitter with the populist backlash against the NHS and discussions about the impacts of immigration? Laclau and Mouffe have been widely cited in an attempt to grasp how popular parties like Podemos and Syriza (in Spain and Greece respectively) may be examples of the ways in which alternative left forces use populism as an appropriate strategy for ‘radical democracy’. Irrespective of the potential, or even the feasibility, these two cases may have had to instill radical democracy, examples of countering or counterbalancing populism have certainly been more prominent in social media, such as Twitter, where we can see users expressing solidarity with, and celebrating the contributions of, migrants across physical and digital borders. These Twitter solidarity practices have become more prominent in social movements that have appeared after the Brexit referendum. Preparing for a second year of action, which culminates on International Migrants Day on 17 February 2018, Matt Carr wrote recently in the Huffington Post, that ‘the word ‘identity’ has become a staple of our national conversation about immigration, usually in order to present migrants and migration as a threat to who ‘we’ are, or as an anomalous aberration…’. This is certainly a different kind of conversation about migration in the UK that conceals the smearing and scapegoating style that is so popular with Farage, Trump and their likes. Now is therefore a good time to look into the narratives that built this movement a year ago and to how migrants’ experiences just after the referendum related to the populist discourse against migrants and the NHS. This retrospection will allow us to see how this year’s action may or may not focus on the same issues, i.e. immigration and the dismantling of the NHS. We traced the corpus of Twitter starting with a couple of months prior to the event. We deployed digital methods to explore linguistic frequencies and used a hashtag and co-word analysis to identify indicators of wider issue dynamics used by the movement. We also traced the kinds of claims, declarations, judgments, commitments and acknowledgments that people made on Twitter and the kinds of stories or conversations they generated regarding certain propositions (or oppositions). Below we offer some insights from the discursive clusters of the themes for the most prominent hashtags and stories of solidary unfolding on the day of the event last year. An early theme in the corpus of tweets within the two months leading to the event focused on the contribution migrants make to the NHS. By cross-referencing Twitter data with what was being reported in the mainstream media, issues concerning social care and the growing public health crisis saw a sharp increase in social media activity. There were two periods of increased activity around this theme – 23-27 January and February 7-10. During these two periods, the word ‘migrant’ (both as a semantic term and as a hashtag) was commonly used alongside terms and hashtags such as #NHS and #SaveOur NHS. The claims in this tweet, which received the most retweets during the time period, were verifiably true. Based on a dataset from the Office of National Statistics, just over a quarter of the NHS Doctors are migrants. NHS Staff Groups by Nationality. Source: ONS Data. Graph produced by Vrikki/Alevizou.Drilling down further into the Twitter dataset revealed other frequently used co-words including ‘contribution’, ‘rights’, ‘justice’, ‘against bigotry’ and #bargainingchip, a term also frequently used to refer to the rights of migrants. Two other hashtags that were frequently used during this campaign were #RightoStay and #StopTrump. The latter hashtag was related to President Trump’s attempts at banning citizens from seven different countries from entering the United States – but was subsequently overruled by the Supreme Court. Interestingly the #RightoStay and StopTrump both have strong correlations with other campaigns like @The3Million – an activist group focusing on the three million EU citizens currently working in the UK – and other migrant associations and activist groups. In these tweets the analysis of the stories leading to the event found expressions of enrichment and solidarity with migrants, as well as gratitude. In the 48 hours leading up to the event, we saw the key hashtags shift and slightly intensify alongside declarations, claims and pleas. #RightoStay, #BargainingChip, #StopTrump #Brexit were all among the top 12 hashtags in the period between December 2016 and 17 February. However, they became the dominant topics of conversation in the 48 hours leading up to the event. By examining and coding the tweets of the day in depth, the stories that formed the event itself on the 20th February changed slightly but not in essence. In fact, even though 41% of the tweets were disseminating content, photos, videos, or commenting and quoting on other tweets, the stories that were told were very much related to what built up the movement during the two earlier weeks. For instance, 28% of the tweets tweeted on the day identified with the causes and demands of the action and showed clear sentiments of solidarity toward migrants in the UK. 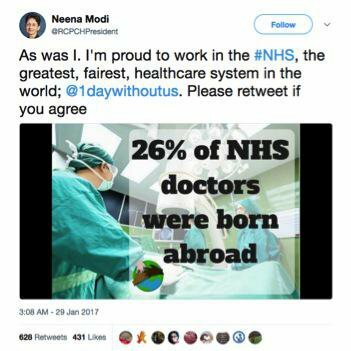 Another 10% of the tweets made reference to the important role migrants play in the NHS and in the UK’s higher education system; suggesting in multiple cases the ways in which the two highly impactful institutions will fail without migrants’ services. 13% of the stories talked about how the mainstream media and the politicians have ignored or have not shown any support to the action (2%), and how the Referendum to Leave the European Union has led to these problematic discussions around migration (5%). Some tweeters attacked the action and its causes, hinting towards the financial impact of migrants in the UK, and called for migrants to leave the country (6%). The turning point of these stories, and the biggest difference between the hashtag stories (i.e. the leading up to the event) with the experience stories (i.e. the unfolding of the event) can be seen in the stories that started forming under the definition of who might be considered a migrant. Some of the tweets (7%) called upon the fact that most of British citizens come from migrant pasts, that their parents or grandparents were migrants from Europe and abroad, and that no one should be considered a lesser human being just because one comes from a different country. The convergence of these diverse stories has created new modalities and avenues to show solidarity, leading to a point whereby social media and especially Twitter, are more than ever shaping discussions around migration and social movements. 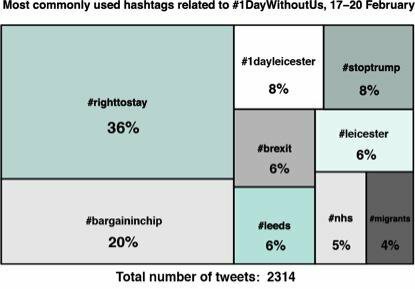 Through the use of hashtags as the vehicle that lead to the interruptive #1DayWithoutUs action day, users displayed new approaches to resisting the populist discourses that enveloped the Brexit campaign. By sharing their views and by using specific hashtags, Twitter users managed to focus on specific issues related to their role as migrants in the UK, or as supporters of migrants, and formed henceforth a ‘radical democracy’ that had more to do with notions of radical resistance against the dominant discourses rather than clear political aims. Twitter here served as a space for migrants and for people who were in solidarity with them to sustain their views, amplify their voices, and built a strong community that has managed to re-organise the same action a year later. What remains to be seen on this Saturday’s One Day Without Us and the months beyond, is how many of those discourses that built the movement last year, have remained or have changed.